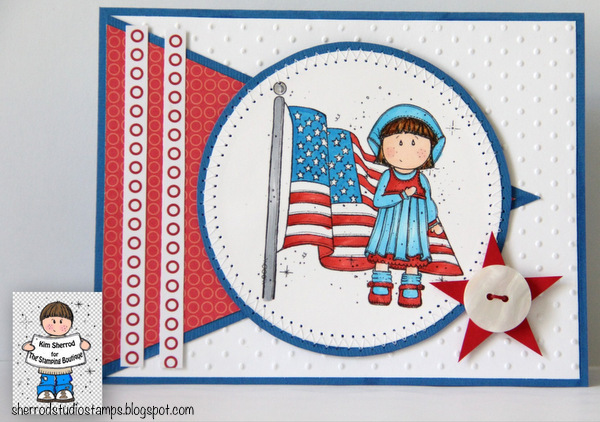 Today The Stamping Boutique's challenge is "Remembering 9/11". I can't believe it's been 11 years since this tragedy happened. We must never forget. I used TSB's Audrey Patriotic stamps on my card. I colored her in using Copics and added zigzag stitches around the circle and added a button onto the star that I cut out. Head on over to The Stamping Boutique's blog to enter and win some stamps. The DT has also created beautiful cards to share. Thank you for taking part in the first Ladybugs Crafts Challenge and don't forget you can enter up to 3 times! Fabulous, love the clean and simple style and striking colours...thanks for joining us at Cupcake! Kim - What a great card. I love the colors and the image is so sweet. I love the sketch you used. It looks wonderful!